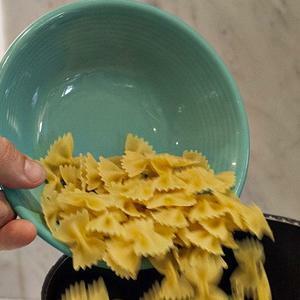 Farfalle pasta, known by many Americans as "bow-ties" is an Italian pasta whose name means "butterflies". This whimsical pasta is formed from rectangles of pasta dough that are trimmed to have ruffled edges and crimped in the center to create the distinctive bow-tie shape. Farfalle's uniquue dips and folds make this pasta ideal for light cream sauces, like in our Creamy Farfalle Pasta with Chicken, Spinach, and Red Peppers. Farfalle is thought to have come from Northern Italy in the 1500's. Now, farfalle is a favorite in American pantries, and its fun shape especially beloved by kids both at dinner time and craft time. Like all pastas, farfalle should be cooked in boiling water until al dente.